The main event draws near but here is a sneak peak In About a Minute of just some of Robert Asman's extraordinary "Flesh and Vapor" photographic mono prints that will be exhibited from April 10th to May 12, 2013 at Artetude Gallery - Asheville NC's newest contemporary fine art gallery. In this video, we explore the relationship between "Flesh" and "Vapor" of four pairs of mono prints using an image transmutation process. Don't forget the Artist Opening Reception on April 12th from 5:30pm to 8:30pm. 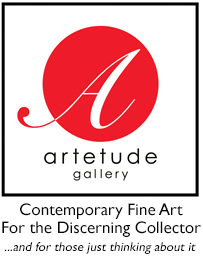 For more information, check out our website www.artetudegallery.com or Facebook page, Artetude Gallery. This exhibit comes at an important time as the use of traditional photographic darkroom processes are undergoing a renaissance by artists partly in response to the ubiquity and impact of digital technology. As a master innovator in the photographic darkroom, Asman is becoming increasingly viewed as one of this country's most important contemporary photographers and a leader in this new movement. For most of the last thirty-five years, Robert Asman has been devoted to investigating and stretching the conceptual and technical boundaries of silver prints. As an alchemist of the dark room, Asman's unique, one-of-a-kind photographic monoprint creations come to form in the darkroom through the boundless manipulation of paper negatives and chemicals. His explorations and technique bind human form, urbanism and nature. Asman approaches art making as a transformative process, in which he mines the physical properties of his materials to create a work on paper in which process and image are one. Asman has received multiple honors throughout his career, such as a Fellowship from the Pennsylvania Council on the Arts and a Pew Fellowship in the Arts. His work has been exhibited in solo and group exhibitions both nationally and internationally, including at the Institute of Contemporary Art in Philadelphia and at Galerie Paviot in Paris. Asman's work can also be found in numerous permanent collections, including The Philadelphia Museum of Art, The Library of Congress in Washington, D.C., and the Smithsonian American Art Museum in Washington, D.C.
An exhibition catalogue will be available at the Opening and updates and videos for this extraordinary and timely exhibition will be posted on www.artetudegallery.com and its Facebook page over the coming weeks. "Flesh and Vapor" will be exhibited at Artetude Gallery from April 10 - May 12, 2013. Please feel free to contact us directly at director@artetudegallery.com or 828-252-1466.